Andy Gillett’s UEFAP site, Using English for Academic Purposes, supported by BALEAP (the British Association of Lecturers in EAP) offers a deep set of resources for academic communication in all skill areas. The best segments of the site offer an introduction, strategic advice and practice exercises, and sample phrases for very specific communicative purposes. The advice given is solid, well-researched, and clearly explained. Sometimes, the best content is buried in unexpected places. In the Reading section of the website, for example, content may seem a bit sparse, but if you happen to click on the keyword “Efficient” in the left vertical frame, you land on a well-developed sequence of advice, models, exercises, and tests on strategies for efficient reading. 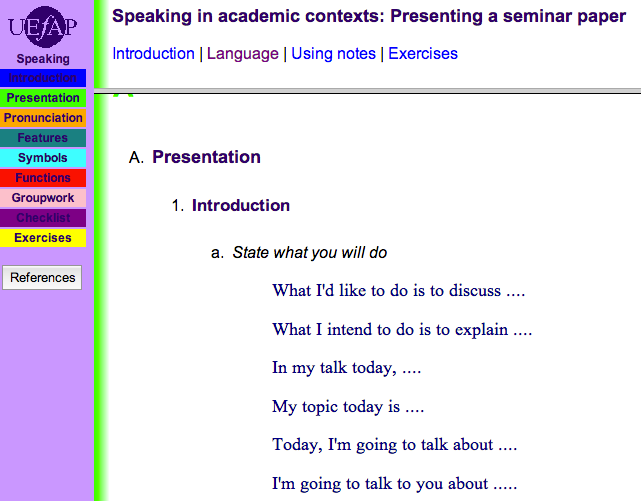 The Presentation-Language topic in the Speaking section of the site includes a useful list of phrases for each moment in a typical academic presentation, including the dreaded Q & A. The Groupwork topic in the Speaking section offers myriad phrases for language functions that might come in handy in discussion or collaboration contexts. Unfortunately, none of the phrases are contextualized, so information about use and frequency is absent. 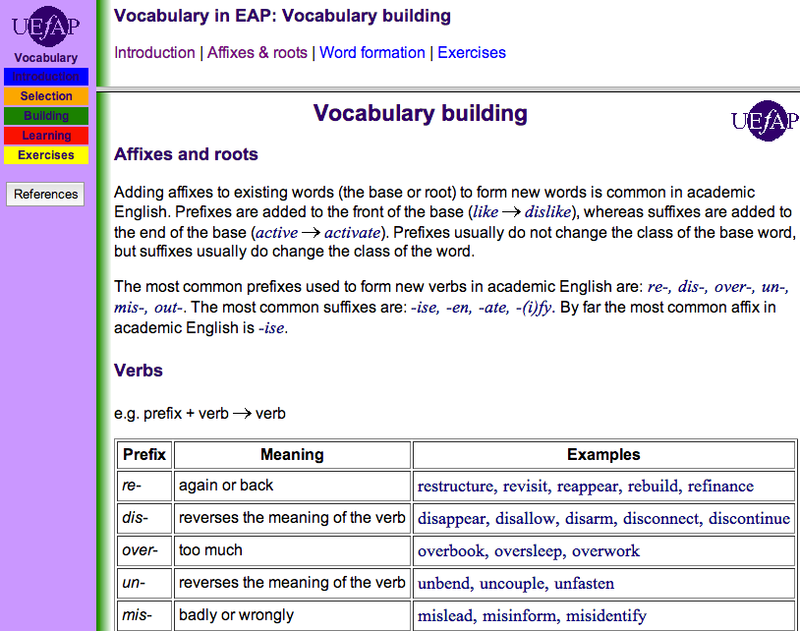 In the Vocabulary section of the site, there is an extensive and well-explained piece on word roots, prefixes, and suffixes. 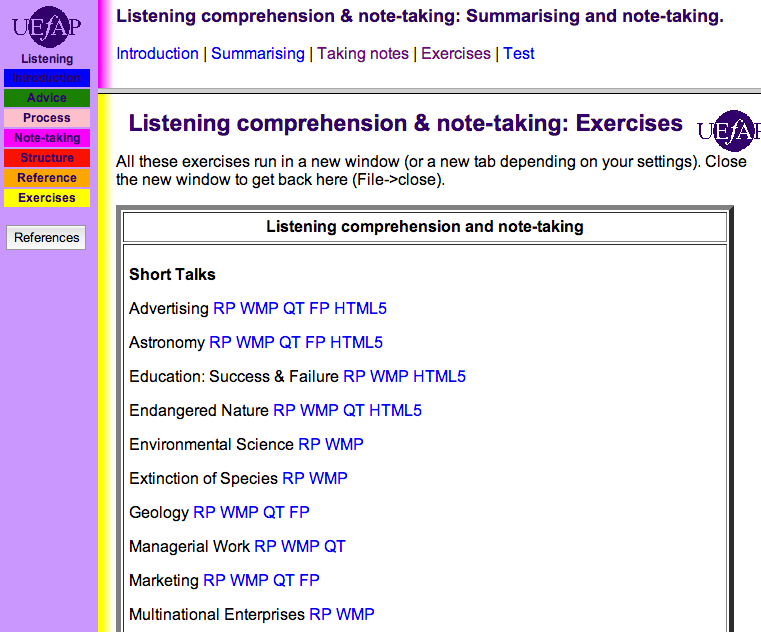 One can access lots of academic word lists here too. The Writing section is the most extensive, with many more topics listed. I have found the “Reporting” topic particularly helpful to students in exploring strategies for paraphrasing and summarizing source texts. Categories: Suggested Websites | Tags: academic, Academic Papers, Academic writing, EAP, english, ESAP, ESP, grammar, language, listening, paraphrasing, plagiarism, presentations, pronunciation, reading, referencing, speaking, summarizing, vocabulary | Permalink. Language teacher, mentor, learner. Specialize in English for Academic Purposes, pronunciation, fluency. Motivated by community-building and social justice. “Got a minute?” Scientific American offers one every day.